The heart the seat of our soul and the perennial pump of our body has its own idiosyncrasies, which keeps us mere mortals on our toes. The heart can fail due to a multitude of causes ranging from the most common such as Ischemic heart disease to something as simple as poorly treated diabetes and hypertension. Drug induced – cocaine, amphetamines etc. 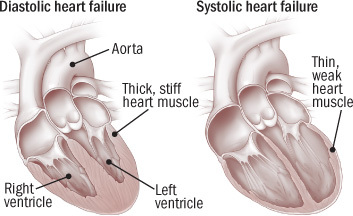 Symptoms of heart failure: what do you feel or present with? Classification or Where do you stand in Heart failure? There two systems of classification. Class II: slight, mild limitation of activity; the patient is comfortable at rest or with mild exertion. Class III: marked limitation of any activity; the patient is comfortable only at rest. Stage A: Patients at high risk for developing HF in the future but no functional or structural heart disorder. Investigations -What tests to do? What to look for in them? Daily weight check: A simple check every morning it should be an ingrained discipline for all patients with heart failure. It gives us a good guide of extra fluid in the body. Chest X-ray: A very basic test which is available everywhere it gives us valuable information on the extent of water logging in the lungs and also on the size of the heart. LVEDD: simply expanded this is the Left Ventricular End Diastolic Diameter. Which is nothing but in layman language the diameter of the heart at the end of diastole or the relaxation period. A value of 5.5 cm is considered that critical point beyond which if the heart keeps expanding it will eventually fail from over stretching. The reasons for this expansion are heart failure from either valve pathology or myocardial infarct or poorly controlled diabetes. It should be a part of every echo report or we need to ask the doctor to give us the measurement and treatment should be tailored to keep it in check. Ejection Fraction: It is the percentage of blood that is pumped out of the heart. Normal values are anything over 55%. This is one of the most abused and misinterpreted measurements. Firstly it is user dependent and is not the most accurate way of assessing heart failure. So please don’t be worried by changes in the value. For the sake of benchmarks, value of less than 35% is considered severe left ventricular dysfunction and 35-45% moderate dysfunction. Angiography: The gold standard for those patients who have had evidence of a heart attack on ECG or those with strong risk factors for coronary artery disease. Management- I have heart failure what do I do? Lifestyle: The first step in the management of heart failure is to get to a disciplined lifestyle. The key changes are fluid restriction and salt restriction as both lead to retention of fluid in the body worsening heart failure. Daily weight check and regular walks are good addendums. Digitalis: it is improves cardiac contractility and sows down the heart rate giving the heart much needed rest and support. It forms the second line of medication. Diuretics: the commonly used diuretics are Lasix or furosemide and torsemide or Dytor. These are loop diuretics and aid in reducing the fluid burden by ensuring good urine output. Aldactone: A potassium sparing diuretic it is a great adjunct to the loop diuretics and also helps improving the left ventricular function. ACE inhibitors: The mainstay of therapy these act by reducing the afterload burden on the heart and helping forward flow. Dry hacking chronic cough is nagging side effect for these wonder drugs. Nitrates: These are useful for those patients with ischemic heart disease and heart failure from that cause. They help improve coronary blood flow and also aid in reducing the pressures in the lung circulation. Beta-blockers: The help reduce the heart rate and prevent any rhythm disturbances that are common in heart failure. There are best increased once the patient is euvolemic or in fluid balance and not overloaded. These are modalities of treatment that help in prolonging life in heart failure patients. 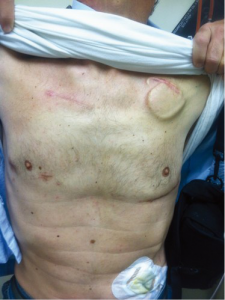 Sudden cardiac death is very common in patients with severe left ventricular dysfunction and is most commonly due to rhythm disturbances such as ventricular fibrillation or ventricular tachycardia. The treatment of choice in these patients is implantation of an Automatic internal cardiac defibrillator (AICD) device. 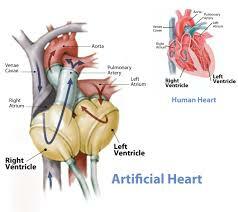 It is implanted like a pacemaker and helps protect from sudden death due to an arrhythmia. In most patients with end stage heart failure the heart is enlarged to a point that the impulses traversing the heart are not in unison and there is dysynchrony as evidenced on the echocardiogram and also in the ECG. 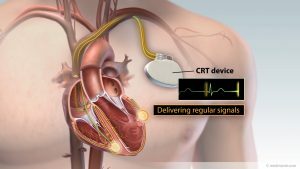 These patients benefit from Cardiac Resynchronization therapy (CRT) devices, the ideal device is a combination of the ICD- CRT also known as a “combo device”. This is again implanted like a usual pacemaker with an additional left ventricular lead to aid in resynchronization therapy. These devices if programmed well can improve ejection fraction by anywhere between 5-10%. They work best in patients with wide QRS complexes on the ECG. A therapy that is used in acute decompensated heart failure resulting in a cardiac arrest. This form of resuscitation is known as E-CPR and is known to salvage these patients much better. It is an invasive form of therapy and involves placing cannulas or tubes in the femoral vessels to help gain access to the circulation and then connecting the patient on to a ECMO machine which is very similar to a heart lung machine. This helps rest the heart and protects all other organ systems. The ECMO is generally used as a last resort when all medical therapies have been exhausted and the patient is heading towards getting an either a artificial heart or a heart transplant. The ECMO works best for a period of 2-3 weeks post which in our experience we see a lot of destruction cells leading to bleeding complications and end organ damage. Veno- Arterial ECMO: this form is used to resuscitate cardiac arrest patients and has improved our salvage rates in this subset of patients. It can be used temporarily to tide over the acute phase or as a bridge to definitive therapy like LVAD or heart transplant. Veno-Venous ECMO: This form of ecmo is used mainly in patients who have severe lung related pathology such as H1N1 infection, viral pneumonias and ARDS. It is excellent form of therapy with good salvage rates. It is best used early in the disease when the lungs are soft and compliant for maximum benefit. It is greatly under utilized in India due to lack of knowledge and cost factors. 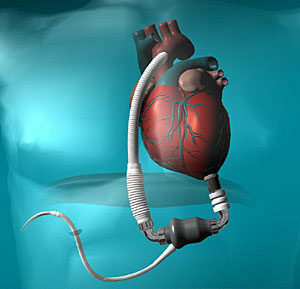 A ventricular assist device as the name goes is a mechanical device that works as your failed ventricle. These devices were designed to give rest or to replace your failed ventricle or pumping chamber. As we all know we have ventricles or pumping chambers, the left and the right. When these fail they leave us in the doldrums making us dependent on medications and eventually to the point of no return. 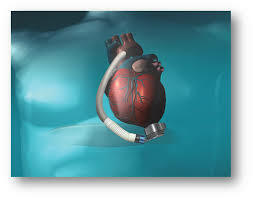 Right Ventricular Assist Devices: These are usually temporary devices and can be placed in the cath lab through a percutaneous approach or can be done surgically if the patient is already on the operating table for any other reason. They help unload the right ventricle and establish forward flow into the lungs enabling good oxygenation and end organ protection. They can be used for a maximum period of 2-4 weeks by which time we will need a long-term plan for these patients. Bridge to transplant: The name is self-explanatory. These are device that are useful for short-term support, which means a maximum period of 3-9 months stretchable to 12 months max. Then one will need to be ready to go transplant or convert into a destination VAD. 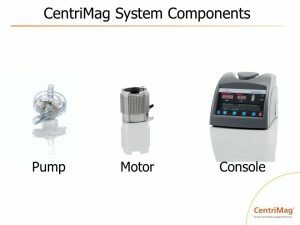 The current ones available in the market are the CENTRIMAG, which are a fairly cost effective choice and a last up to a period of 9 months. Heart mate 2 and Heart mate 3: The heart mate 2 has been a favorite for many years and now is replaced by its new avatar the 3, which is smaller and is the new technology that is Magnetic levitation pump. 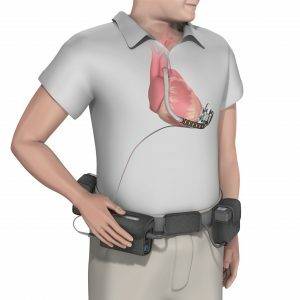 Heartware: They were to first come out with the smaller devices and changed the landscape of LVAD implantation making it feasible for us to implant them through a minimal access approach. 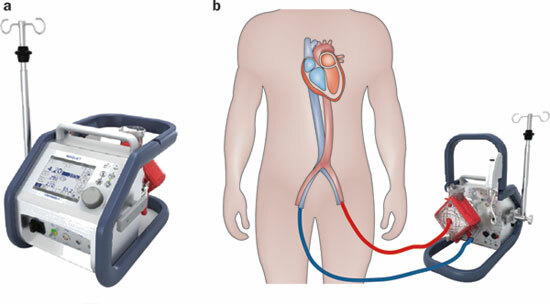 Total Artificial heart- Cardiowest device: This is total artificial heart and replaces both the pumping chambers of the heart with mechanical devices while retaining the collecting chambers to help with the filling side of things. It is indicated in patients who have biventricular failure and require ideally a transplant but cannot get organs or for some other reason are not ready for the procedure. Minimal Access Implantation techniques: The VAD’s were initially very bulky devices and required big incisions to seat them properly. 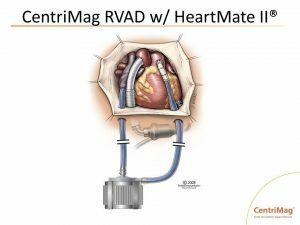 Today we are seeing a new generation of LVAD’s, which are small and permit us to implant them through a minimal access approach. 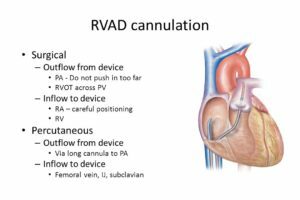 LVAD minimal access approach for implantation. Heart transplantation: This is the final frontier that cardiac surgeons see. End stage heart failure, which has spent its lifetime with devices or cannot get one, is left with no choice but to get a heart transplant. The operation in itself is a very simple procedure whose success depends on a good heart team and fast competent surgical team. All one needs is a height, weight, and blood group match to be able to get a heart. The results in good volume centers are good and there is a life expectancy of 10 years if done well and on the right patients.